Fear not my weary pilgrims, this is much easier than it seems!! 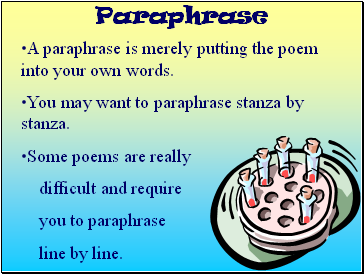 A paraphrase is merely putting the poem into your own words. You may want to paraphrase stanza by stanza. This is your true chance to shine and demonstrate how much you really know! Start small - point out how many stanzas etc. Then, go for the GUSTO! 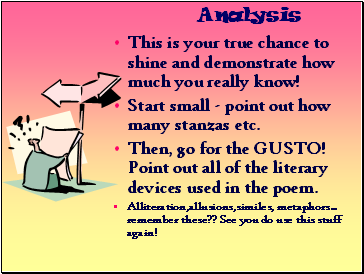 Point out all of the literary devices used in the poem. Alliteration,allusions,similes, metaphors… remember these?? See you do use this stuff again! This is a paragraph on what YOU think the poet is trying to say to you. This portion of the explication will be different for each person. There really is NO WRONG ANSWER as long as you back up what your saying! 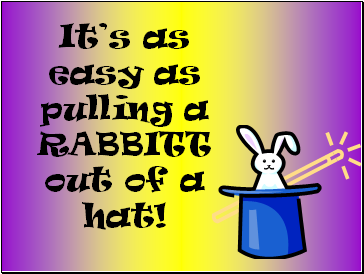 It’s as easy as pulling a RABBITT out of a hat!